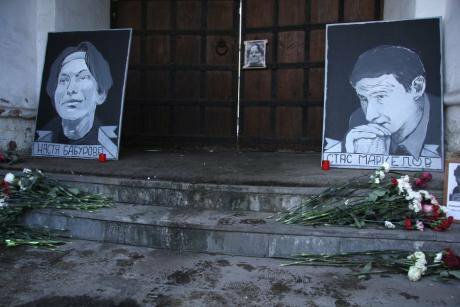 Ten years ago, activist lawyer Stanislav Markelov was murdered in Moscow. His legacy tells us why anti-fascism remains vitally important in Russia today. On 19 January 2009, Stanislav Markelov and Anastasia Baburova were murdered. Every year since, Russian anti-fascists hold a march in their memory. Source: anatrrra / Livejournal. Ten years ago, Stanislav Markelov was murdered in Moscow. He defended anti-fascists and ecologists, mothers trying to defend their sons serving in the army and citizens of Blagoveshchensk brutalised at the hands of the riot police, the relatives of Elza Kungayeva (murdered by a Russian soldier in Chechnya) and journalist Mikhail Beketov, who was brutally assaulted for covering the construction of a new highway near Moscow. That day in January, the Neo-Nazis also killed his companion Anastasia Baburova, a like-minded journalist. The killers were eventually sentenced to long prison terms. Some of their friends and sympathisers are now working for government bodies or pro-regime mass media, whereas others have fought and still fight on both sides of the conflict in Ukraine. As a figure, Markelov feels so necessary in Russia today, yet so hard to imagine. Starting in the hippie subculture of the perestroika era, Markelov went on to join the Student Defence trade union and Defenders of the Rainbow eco-movement. Later, he was a legal representative in some of the country’s most dangerous and high-profile cases — and a proponent of Russia’s new anti-fascism. In the 1990s, Markelov was among those who appealed to the non-Bolshevik traditions of the Left, caught between aggressive free marketeers and Soviet revanchists. During the Constitutional Crisis in October 1993, he joined the Voloshin Medical Brigade, who helped everyone in need of medical assistance, no matter what side they took amidst the bloody conflict. Looking back, this healing of wounds and applying of stitches on the streets of Moscow in 1993 feels like an attempt to symbolically unite two parts of a broken society. On the one hand, the enthusiasts of 1991, the people who, in 1993, still believed in the imminent triumph of liberal democracy. On the other, the people who believed that the near future would bring nothing good, but had no counter-agenda except a fanatical anti-liberalism and their memories of the USSR. This rupture is yet to close, and Markelov — who mixed liberal human rights work with left-wing values — was the living embodiment of the attempt to overcome it. This combination is something very unusual in Russia. Ever since Soviet times, the majority of Russian liberals who have believed in human rights have shown skepticism towards any discussion of social justice and equality. Leftists, on the contrary, often interpret the rhetoric of human rights as a cover for the economic aggression of neoliberalism. However, the fact remains that liberals in Russia cannot survive without a serious shift to the left (a truth that Alexey Navalny has understood all too well), while leftists, who easily turn to liberal human rights organisation for free assistance, and then brand them as enemies of the working class, look simply ridiculous in this instance. 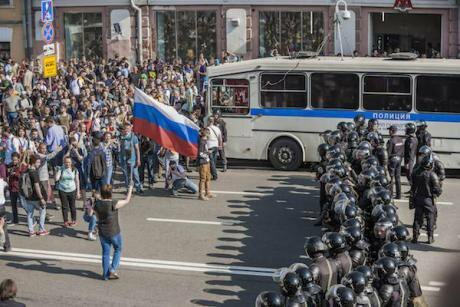 Riot police surround people during a demonstration against Vladimir Putin in Moscow, on 5 May 2018. Photo: NurPhoto / SIPA USA / PA Images. All rights reserved. Laughing bitterly at this absurd situation, the unique nature of Markelov’s experience is clear. Markelov came to work as a lawyer through his political activism, and then, for the sake of defending the most vulnerable and powerless people in society, disdained both a steady professional career and every stereotype on why the personal, political and professional should not be mixed in legal work. Indeed, Markelov demonstrated another important fact, and one that sounds outlandish in Russia: an engaged lawyer, just like an engaged journalist, is not someone who performs a client’s requests for money, but someone who follows his civic and political convictions and the norms of their professional community. Realising how important a network of engaged lawyers was for the survival of left-wing and social movements, and focusing on the rich global (and our own pre-revolutionary) experience, Markelov created the Institute of the Rule of Law — a group of lawyers who were ready to defend activists and victims of arbitrary violence for free. Markelov’s distinct place within and on the borders of several milieux, in the midst of activists and as their public representative, at social forums and academic debates, freed him from paralysing group stereotypes. It allowed him to act in a courageous, paradoxical and innovative manner, bringing him closer to that truth which is bigger than the truth of the “correct political statement” and to a transformative practice that is more than defending people’s rights. It allowed him to make precise and audacious conclusions on past experience — and to predict important global trends. 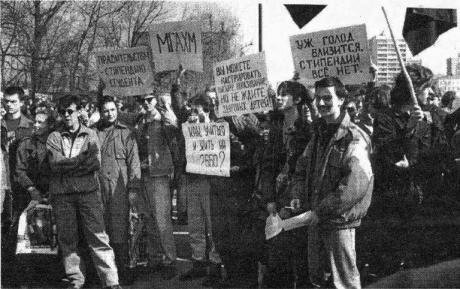 Student Defence march, 12 April 1995, in Moscow. Source: Student Defence archive / Maoism.ru. In this sense, we can understand Markelov’s reasoning at the end of the 1990s that, against the backdrop of general anti-communist sentiments, the tolerance of most liberals towards the far-right spawns the monster of national-liberalism, the danger of the 21st century. This, in Markelov’s opinion, was comparable to Nazism in the 20th Century. During the same period, he forecast the division amongst the liberal camp between those who moved left, towards social democracy, and those who preferred an alliance with nationalists. A desire and ability to bring together different milieus over made-up and real barriers, as well as a programmatic belief that far-right groups present a threat to democracy always and everywhere — Markelov’s position wasn’t only heroic (alas, later proved by the course of events). There was also a rare political maturity to this position, and one which stands out against the sectarianism and tactical lack of principles among Russia’s political opposition (two extremes, which easily combine together). “Of course, I’m against fascism, but please don’t hurt anyone,” as the Russian version of Phil Och’s song “Love me, I’m a Liberal” goes, a parody of the political tolerance inherent in liberalism. A progressive civil society and the left-wing movement should push back against Nazis, Markelov believed, otherwise they, together with the rich and powerful, can harm everyone else sometime in the future. When the fights between Nazis and anti-fascists, including the demonstrative murders of the latter, became part of everyday life in Russia during the mid-2000s, and a significant part of the Russian intelligentsia looked on this as two broadly identical groups having spun out of control, Markelov decidedly took the side of the anti-fascists. He pointed the finger at the street-level killers and their high-placed patrons, wrote the famous text “Patriotism as a Diagnosis”, and, most likely, the anonymous brochure “The Red Book of Anti-Fa”. Here, Markelov explains his rather anarchist understanding of the “home front” — the commune, the squat and other self-organised spaces where a life without exploitation and hierarchy is possible, and a completely socialist understanding of the “front”, as a public and political fight with fascism in power and in society. Soon after Stas died, and with various challenges in full swing — repression, 2011-2012 protests, events in Ukraine — the anti-fascist movement in Russia more or less came to an end. But its story isn’t finished. Hopes that young people, dissatisfied with the system, would become involved in trade union, worker and other social struggles rather than street battles between left and right have not, so to speak, come to full fruition. This is natural: the less protection working people enjoy, the less chances there are for professional and class solidarity. And the more chances ideological aggression has for pure blood, pure nation, pure culture, for this or that heroic version of history. An aggression that irrevocably pours out onto the streets, provokes reaction and pushes everyone into new and bloody conflicts. And so, outbursts of anti-migrant and generally nationalist hysteria, tactical connections between street Nazis and the state (and, on occasion, the opposition too), street-level struggle — all of this can return at any moment. Will we prepare ourselves better this time? Markelov showed that, with public speakers and dedicated lawyers, anti-fascism can be bigger than a fashionable subculture or an ideology abused by the state. It can become the basis of a new civic community. Or perhaps not: Stas’ speeches sound like a reproach to those who, in recent years, have used the memory of the victory over fascism in 1945 to justify external aggression, and others who denied the completely real street violence of Nazis in Ukraine in 2014 and their structural links with the new authorities. "I'm tired of seeing my friends in the criminal news... I'm tired of opening up criminal case files and seeing the first point of an individual's guilt as being a member of the anti-fa movement." Stanislav Markelov at a protest against political terror, 0 November 2008. Source: Grani. It is clear that in those new and difficult situations — the ones that Markelov did not live to see — he would have tried with all his might to find a common platform for the opposition in Russia, fighting off aggressive and destructive extremisms. A platform that would be anti-imperialist, anti-fascist and truly democratic. An important final detail: the Bolotnaya Square and Occupy Abay movements were not only attempts to unite various political forces. They became the peak of integration of different forms of activism, the politicisation of intellectual and creative efforts. In the aftermath, as disappointment and economic downturn set in, the specialisation and depoliticisation began. Many people turned to their careers or their private lives, leaving behind their attempts to combine the uncombinable. To even attempt this today, we need even more selfless drive than people had during Markelov’s time. Ten years after the death of Stas, his front — the struggle of a public intellectual, anti-fascist and democrat who stood for human dignity and justice — awaits us all. Translated by Giuliano Vivaldi and Tom Rowley.